eDiscovery has never been this good! Because we now have a range of eDiscovery applications to choose from. Small law firms used to have to pay exorbitant prices for clunky, poorly functioning, and hard-to-use software. Luckily that’s changing. As technology improves, it’s cheaper and easier for companies to design software. Which means more competition. Which means more choice. So, how do you find the right eDiscovery software for your firm? Step 1: List the features you’ll need. How big are my cases, on average? If they’re just a few hundred files (less than a GB), then any software will do. But if your cases get larger, make sure your software can scale up too. Do I have an IT team? If not, you want software that is quick (and simple) to set up, is easy to use, and has good tech support. What is my budget? Remember, you have options. So be honest with yourself about how much you’re willing to spend. It’s possible to get powerful but cost-effective software. The trick is to find one that focusses only on letting you search, tag, redact, and produce your files. That’s all you’ll need. Anything more and you’re paying for features you’ll never use. Will I need to access my files from more than one computer? If so, make sure you get software that’s Cloud-based. That way, you can use it from work, home, or even on-the-go. All you’ll need is a laptop and an internet connection. Step 2: Look for software. Find ones with per-GB rates that you can use to compare prices. Now it’s time to start Googling. 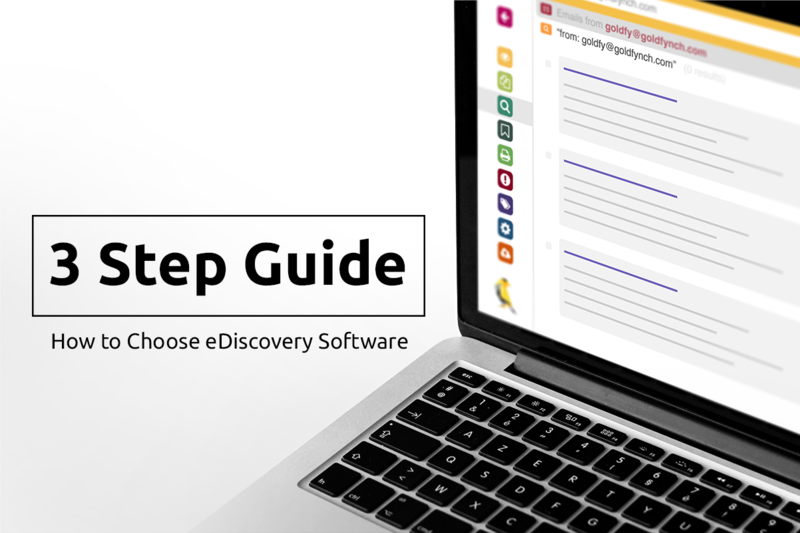 Use your list from Step 1 above to sort through the different eDiscovery applications on the market. And once you’ve zeroed in on your two or three best options, look at how they’re priced. ‘Fixed volume’ pricing: Storage space is divided into chunks (or ‘plans’)—e.g., 3 GB, 5 GB, 10 GB, etc. And their prices have been set in advance. So, you choose a plan you want and pay a fixed amount for it. Per-GB pricing seems fairer (you pay for only what you use), but it’s harder to calculate your bill (if you case size shrinks from 3 GB to 1 GB, do you pay for the largest size it got to—3 GB? Or its average size—2.5 GB?). Fixed-volume pricing means a predictable bill, but you may end up paying for storage space you’re not using. The billing is simple. Choose a plan. Look at the cost. Pay that cost at the end of the month. That’s it. You pay for only what you use. Having a fixed plan means that minor fluctuations in your case size don’t matter. But if there’s a significant change, prorated pricing keeps things fair. Say you use an 8 GB plan. And halfway through the month, you delete a bunch of files. Which leaves you with 4.5 GB of data. You can now switch to a lower, 5 GB plan. And you’ll pay for only half a month on the 8 GB plan and half a month on the 5 GB plan. Another thing: When you go to the ‘pricing’ page of each application, make sure it’s easy to understand what you’ll be paying for. The more complex the charts and graphs on that page, the more they’re trying to hide. Learn how to get predictable eDiscovery pricing. Step 3: Reassess your software every year. Technology improves exponentially in the eDiscovery world. So, every year, use Steps 1 and 2 to survey the market again. Also ask other attorneys what they’re using and why. And if you find an attractive offer, try out the software. If it works out, then transition into it. If not, just move on. Need affordable eDiscovery software? Try GoldFynch. It’s an easy-to-use eDiscovery application that’s designed specifically for small law firms like yours. No set-up required. Since it runs in the Cloud, you use it through your web browser. So you can start working immediately. No installation. No sales calls or emails. Plus, you get a free, fully-functional trial case (0.5 GB of data and processing cap of 1 GB), without even needing to add a credit card. It’s easy to use. Just like any other app on your phone. It lets you do eDiscovery essentials. Like, searching, tagging, and ‘producing’ files. And redacting privileged information. You get the best technical support: It’s designed, developed and run by the same team. So, the technical support isn’t outsourced. Which means prompt and reliable service. Most importantly, it’s affordable. Just $10 a month for a 1 GB case. That’s $25 less—every month—than the nearest comparable software. And hundreds of dollars cheaper than many others. Plus, the billing is prorated. Also, GoldFynch can grow with your case, as you keep adding more data. Cases can range from 1 GB to 100s of GBs. Intrigued? Here’s how you can find out more.